New Orleans Pelicans power forward Anthony Davis (23) drives against Golden State Warriors power forward David Lee during the first half of the NBA basketball game in New Orleans, Saturday, Jan. 18, 2014. The face of the Pelicans franchise has now written his name on another page of the club’s history book. 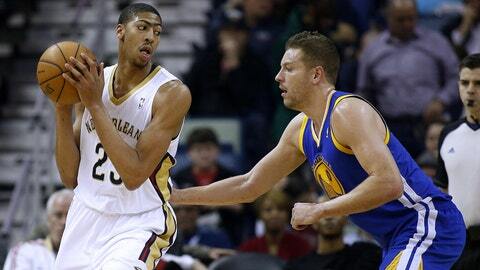 Forward Anthony Davis notched his seventh straight 20+ point game Saturday night versus the Golden State Warriors. It has been nearly four years since any New Orleans player posted seven or more consecutive 20+ point performances in a single season. Former New Orleans’ stars Chris Paul and David West delivered such performances back in 2008, 2009 and 2010. Davis is now chasing Paul’s record of ten consecutive games of 20+ point games, set in 2009.